Wu Lao Guo is a renowned Steam Boat Restaurant owned by the Tripodking Group (鼎王国际餐饮股份有限公司). Elixir Health Pot (無老鍋) or Wu Lao Guo, is an brand expansion of the famous Tripodking Spicy Hot Pot and opened it’s door in Year 2009. This place was recommended by a friend who sworn that this is his number 1 for Best Steamboat, even better than our Singapore’s Hai Di Lao (海底捞). I went to their Taipei branch at Zhongshan Station (中山站) which is about 7 minutes walk from MRT. I wouldn’t be able to get a table without reservation as it’s full house on a Sunday evening. The dining ambiance is little different from a typical Chinese style restaurant. The dining floor is dimly lited with most of the light coming from a pair of bright dining light overhanging the hot pot. Each and every table is spaciously partitioned into a semi-private dining area. I opt for their Ice Cream Tofu soup base that is boiled in ingredients like pork bone and ginseng. Honestly, this broth is best thing at Wu Lao Guo. It’s definitely satisfying for people that like Tonkotsu broth but this broth is like three times more flavourful. The ingredients in the soup is refillable as well. I can say that I have never tasted a steamboat base with such a strong flavour before. And that is when I understand why there are only three items at the condiment counter, because there is no need for it. Everything that you dumped into the pot comes out tasty. I’m quite satisfied with most of the items that i’d ordered. Items like the thinly sliced Shabu Shabu Pork, fried dough stick and bean curb skin are very enjoyable thanks to the robust soup base. The pork dumpling is very well flavoured, it’s like as if you are eating the fillings of some pork bun (肉包) found in Singapore with a typical meat ball texture. The cooked Scallop Paste also has a fish-like fibery texture, with a blend of sweet and savoury taste. This is something that I will order again if I’m back next time. The texture of the ice cream tofu is very fluffy and soft and unlike this name suggest, it doesn’t has a sweet taste. It doesn’t exactly melt in your mouth but it’s pretty interesting as I never had anything similar in Singapore before. However it’s not something that I will order if it doesn’t comes with the soup. Apart from the food, I’m rather impressed with Wu Lao Guo’s service. The waitresses are very attentive to my requests and always bow at 90 degree whenever she attended to a request. Talking about VIP treatment. If you want some variety instead of just whacking the cheap and tasty Taiwanese street food, Elixir Health Pot (Wu Lao Guo) may just be the place. On top of providing comfort and great service, their food is pretty outstanding too. Looking for a nice restaurant to bring your parents I hear? The price is not exactly economical, but if you are ok with price of Singapore’s Hai Di Lao (海底捞), you will definitely be ok with this. Personally, i feel that this is more bang for your bucks than Hai Di Lao. If you intend to visit this place, i would suggest to make an online reservation ( http://partner.eztable.com/booking.php?page_name=wulao). Going to Wu Lao Guo Zhongshan Brunch is very simple and straightforward. 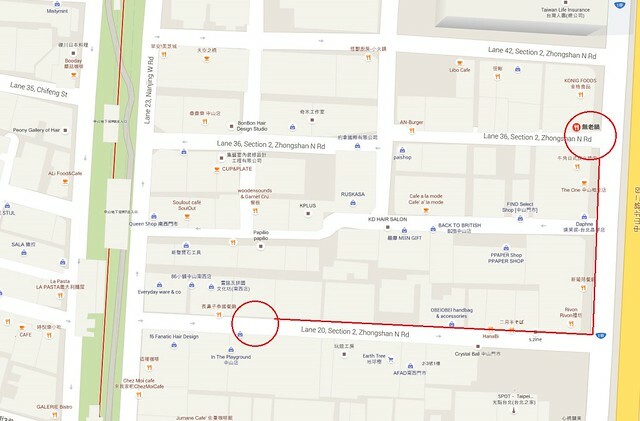 Continue walking straight until you come to Zhongshan North Road. You won’t miss this. It’s a main road.